verbs.cat does not only provide conjugation tables and background information about Catalan verbs. You can also practise your skills online: Roll up your sleeves and train complete tenses or when you're brave try the random form trainer. Wondering how to use the subjunctive? Learn about the subjuntiu and a lot more about the usage of modes, tenses and verbs in Catalan in the article section. 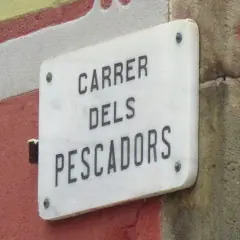 Parles català? verbs.cat helps you learn Catalan verbs. This site offers a lot to help you learning the Catalan language. Find complete conjugation tables of more than a thousand verbs. Type in a verb or look one up in one of the categories. Do you need more background information on the subjunctive mode, compound tenses or other topics on Catalan verbs? 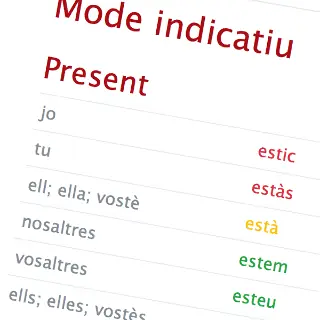 Go to the article section where you can read about the usage of modes and tenses in Catalan. 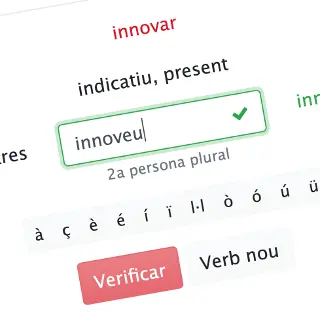 Furthermore you can practise Catalan verb conjugations on line in several interactive ways. It's all for free! Where do people speak Catalan? Catalan is a Romance language that shares many characteristics with Spanish, Occitan and French. It is spoken in Catalonia, the region of Valencia, the Balearic Islands and a eastern edge of Aragon. It is also spoken in Andorra and in the city of Alghero (Sardinia) and Northern Catalonia (in the extreme South of France). Over ten million people speak Catalan. verbs.cat is based on central Catalan.